The Daily Scam | Why is this legitimate? You are here: Home » Why is this legitimate? 1. 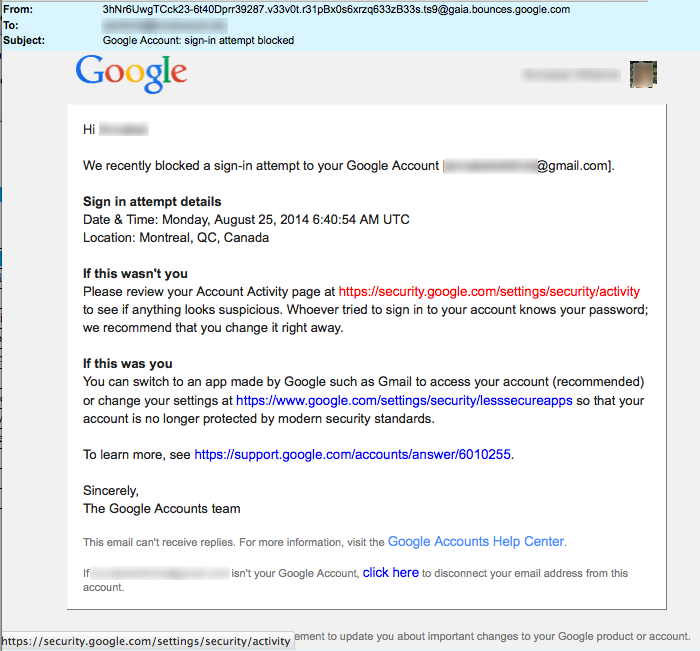 The email says that it comes from Google and the sender’s email address supports that. It is remarkable how many scams speak so personally to the recipient without ever naming the recipient or providing any account information that offers some legitimacy to the email. “Dear Customer” or “Dear Bank Account Holder” doesn’t inspire us! 3. A mouse-over of every link demonstrates that they all point back to a Google.com website. Mouse-overs are still one of the most important skills to detect online link fraud. Visit our article about mouse-over skills or our video “Mouse-Over Skills Explained” to learn more. 4. Most of the links contain https. The “s” in https stands for secure! It means that encryption will be used to communicate with the distant computer. If you are expecting to log into your Google account, it had better be a secure connection!